There are a few hotel names that bob up in many different towns, for example - the Railway, the Post Office, the Royal - and today's venue, the Exchange. In fact different versions of the name "Exchange" have existed in Brisbane hotels. 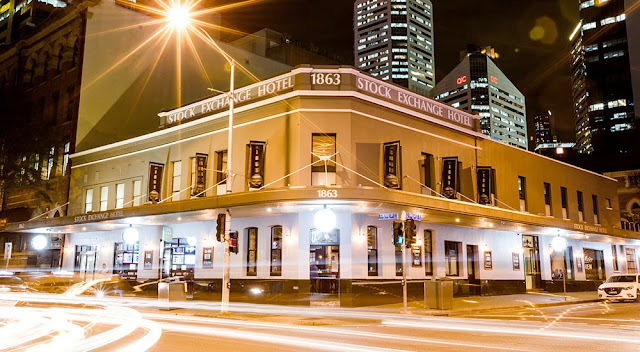 The original Stock Exchange Hotel operated by Mrs Sarah Balls was situated in Queen St between Creek and Wharf Streets and the Royal Exchange Hotel that was owned at one time by Patrick Mayne was on the corner of Elizabeth and Albert Streets. 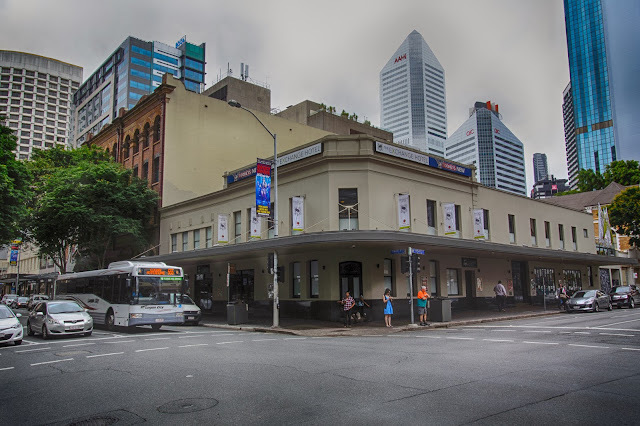 Both of these have disappeared, although these days there is a Royal Exchange Hotel at Toowong. Remaining in the CBD is the Exchange Hotel on the corner of Edward and Charlotte Streets that was constructed in 1863 and is held on the Brisbane City Council's heritage list. Here is the earliest picture of it that I could find, taken in the late 1880s. 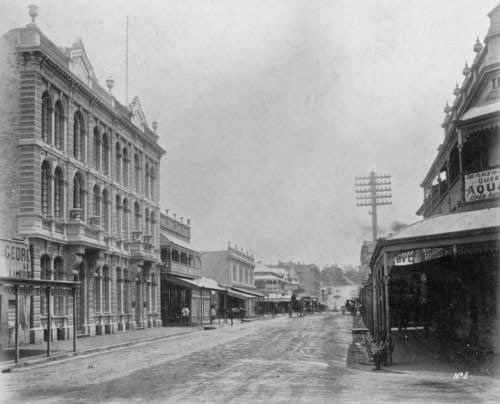 It is taken from Elizabeth St looking up Edward St towards Spring Hill, and the Exchange is seen in part on the right side of the photo. There were some improvements made to the building in 1887 by architect John Ibler, and then when licensee Mr P Talty took over in 1897 he promised to make it an "up-to-date family hotel" with a "much altered and improved private bar". 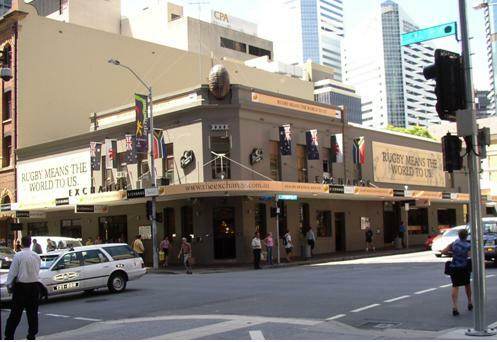 The following image was taken a decade later and shows the Exchange Hotel next to the Edwards Dunlop Building which in turn is listed on the Queensland government's heritage list. The sign at the front of the hotel proclaims Henry Biggs is now the proprietor. When I started work in the city in the sixties, the Exchange Hotel was not quite the closest to the office where I worked, but the back beer garden of the Exchange became the favourite venue for the keg parties that were the standard office celebration for 21st birthdays, engagements and weddings, getting "called-up" (conscripted) or returning from the army, whether scathed or unscathed. In an office that contained several hundred mostly young workers there were plenty of opportunities to "tap" a keg, and we were frequent visitors. There was a "Select Steak Room" there too, as evidenced by the following tram advertisement for Quinn's Exchange Hotel. Over the ensuing years the hotel has been subtly altered from time to time in order to re-invent itself in the face of increasing competition and changing tastes. Like many of the other older hotel buildings, the verandahs have been removed and there is an abundance of advertising signage. In the photo below the 2011 rugby World Cup is the theme to lure patrons to the venue - the flags and the oversized football a somewhat kitsch statement. In my photograph taken earlier this year the signs are a little less obtrusive and the exterior a little more muted. However, a visit to the hotel's web page just prior to posting this piece reveals more changes. The hotel has undergone a complete makeover in recent months, featuring a new look and new management. The date of the hotel's beginnings is featured, together with a name change. And, a blast from the past! It is now the Stock Exchange Hotel. I realise everything changes over the decades. But but... they had a great Victorian hotel and a great corner location. Why not repair the verandas and clean up the wrought iron lace work, and retain its typical Australian quality? These days they seem to want to cram you into noisy air-conditioned rooms rather than let you sit outside in our (usually) balmy climate. As the Exchange already has a large open air rooftop area, there's probably not much value to be gained from rebuilding the verandahs. Besides, I personally think its one of the better looking verandah-less pubs. I'd rather see verandahs go back on the Victory across the road, or the Royal George in the Valley. Those two pubs need all the help they can get from a visual point of view! Oh the memories at the "Stocky" or as my dad would call it "the ashtray with music". Yes, thank goodness there's no smoking inside hotels these days. However you still have to run the gauntlet through the clusters of smokers blocking doorways!